Throw your name into the hat! 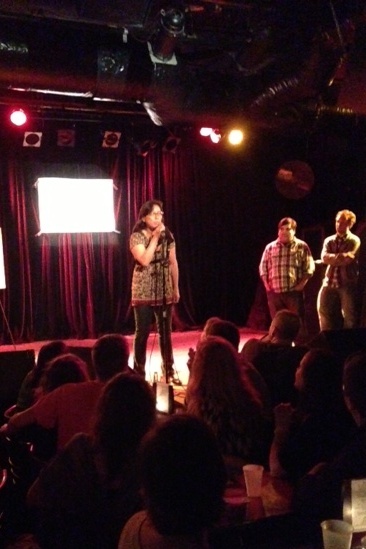 The other night, I attended my first Moth Story Slam ever. You might have heard about it – it’s an opportunity for a person to have their name randomly drawn for the opportunity to go up to the mike and tell a story for 5 minutes. The story must relate to the theme for the night, and you have to tell it without notes…oh, and three groups of judges will rate your performance….and then there’s the audience! At first, I was going to do my typical thing, just observe for the night, learn how it works, study the event as if it were my prey so that next time, I would be fully prepared. However that night, I brought my “what the hell” attitude with me, so I threw my name into the hat. The moments before I went up to the mike were the most heart-pounding, exhilarating, deliciously scary moments I’ve had in a while. I was totally out of my element, and it felt great! What I got out of this experience is that I have stories that I want to tell, loudly, boldly, with humor, with pathos. So I’m going to go back again and again, and throw my name in the hat over and over, until I have my 5 minutes. My 10 minutes. My many minutes. I’d like you to consider the possibility of throwing your own name into a hat yourself. It could be a small hat or an enormous one. A hat you’ve been eyeing for some time, or one that just happened to present itself to you, much like the Moth Story Slam did to me. If you were to just throw your name in, what would be possible for you?